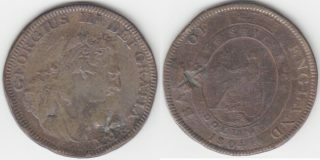 Melbourne Numismatic Society September Meeting - Melbourne Numismatic Society Inc. The September Meeting will be held from 8-10pm on Thursday 13th at the usual venue – Box Hill Community Arts Centre, Combarton St. Box Hill. This month the syllabus topic is “Fake and Doctored (tooled etc) Coins and Banknotes”. Illustrated is a very poor fake of a Bank of England Dollar of 1804 – a coin rated at 5 shillings which was a considerable sum at the time. It may have originally been plated or washed with silver over the copper core. There are big punchmarks on both sides where someone has exposed the copper core. In addition to examples of fakery please bring along any new acquisitions or other items you would like to show and discuss. As usual the meeting is followed by a coffee, biscuit and numismatic chat.